Wednesday we leave our island paradise and turn inland for a couple "re-positioning" one-night stops. It's a beautiful drive from the coast on Hwy 64. With marshlands along both sides we see several turtles sunning on small logs. Very cool! RVacation Campground is right on I-95 - only a narrow frontage road between the office and the freeway fence. But it's a beautiful park with well maintained grounds, and good sized spaces. We have a 100 foot site and stay hooked up overnight. One of the largest sites we've had - so of course we're only here for one night. We don't see a lot of tiny houses in our travels, but this one has a very sweet site, and a nice screened porch. Thursday takes us into our 39th state - South Carolina. We start to see signs of hurricane impact along the highway. Some trees are snapped in half, others are uprooted. Lots of standing water. No structural damage. 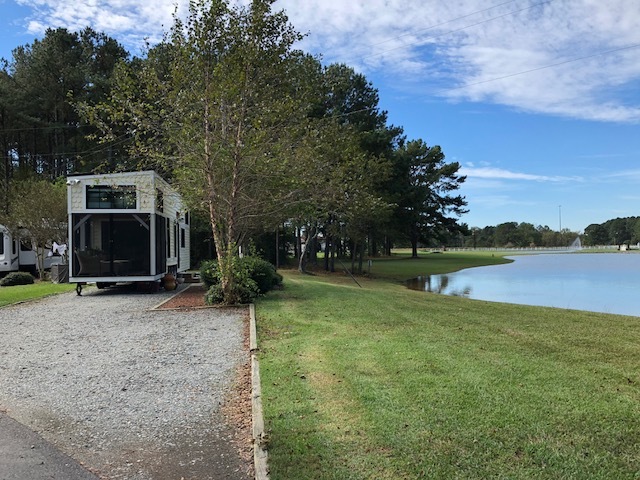 Swamp Fox Campground is a big step-down from our last stop, and is not a great introduction to a new state. The Passport America rate of $22 is the reason we're here - it is definitely not worth a full price rate! Trashy seasonals, and grounds in need of general maintenance. Not somewhere we'd return to. 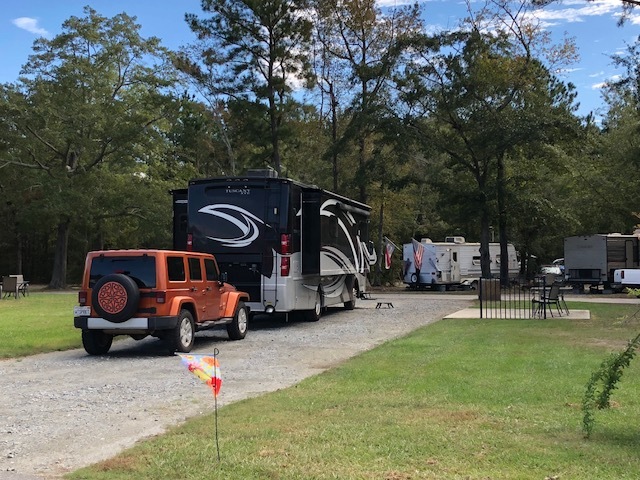 It's a beautiful blue-sky Friday drive to Charleston, South Carolina where we're happy to find Oak Plantation RV Resort is a lovely park. It's pricey, but it's the weekend in a popular city, and I was happy to find a spot. 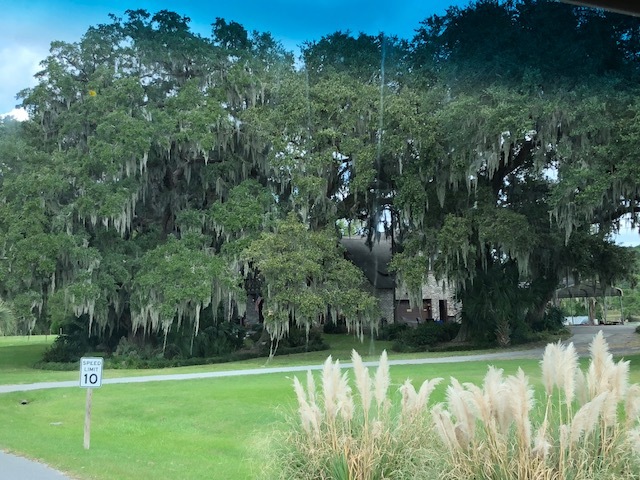 Spanish Moss hanging from huge Live Oaks lets us know we're really in the southeast now. Just down the street is a little local eatery where we enjoy a couple of the best meals we've had. The rich flavors are amazing in both my shrimp and cheesy grits and Bill's spicy shrimp steamed buns. Angel Oak is fabulous! While our inland stops had nice, cool temps, we're back in the heat and humidity here. I'm not sure how much we'll be able to see from an enclosed tour bus, but it's air conditioned and will at least give us a good introduction to the city. The Gray Line Historic Tour ends up being a good experience, and with only six of us on board it's even better! A very nice visitor center that needs a separate counter for tour tickets - now you stand and wait while the staff at every window tell long histories to each person. A submarine in the Civil War??? Yes, this iron Confederate ship was pedal-powered by the crew! Using a twenty foot bar on the front of the sub to ram and deploy a torpedo, the Hunley successfully sunk the USS Housatonic on February 17, 1864. The sub did not return, and all eight crewman were lost. When it was located in 1996, evidence showed the explosion of the torpedo also damaged and sunk the sub. Restored, not replicated - required in Charleston. Petticoat Stairs - ladies pulled up their hoops skirts to climb stairs and certainly didn't want gentlemen behind them! Instead, separate stairs are included on many old homes to avoid such social awkwardness. Charleston prides itself on a history of religious freedom. Seven people could apply for and be granted a permit to build a house of worship for any shared belief system. This is the oldest Unitarian Church in the country. There are no scheduled stops on the tour, but our driver stopped to visit this beautiful church interior. The ceiling looks like lace. The end of homes face the street, with large porches along the side. Formal, multi-level porches. Beautiful but facing your neighbor's wall. Our only other stop is along the harbor. We're able to see Ft Sumter with zoom. Even more impressive is this container ship! The tops of the sails actually come up to the bottom of the red letters. Baskets, wreathes and other handmade items from palmetto fronds - for sale on many corners. Beautiful ironwork throughout the city. Built in the early 1800's, the siding looks like stonework, but is actually thick wood planks scored to look that way. We very much enjoyed our tour of historic Charleston. Our guide pointed out the city's tolerance at one intersection with a Jewish temple and a pork BBQ, and a Catholic church and a Victoria's Secret! I thought it was a great representation of a special place. Near the visitor center is another lovely eatery - Sol. 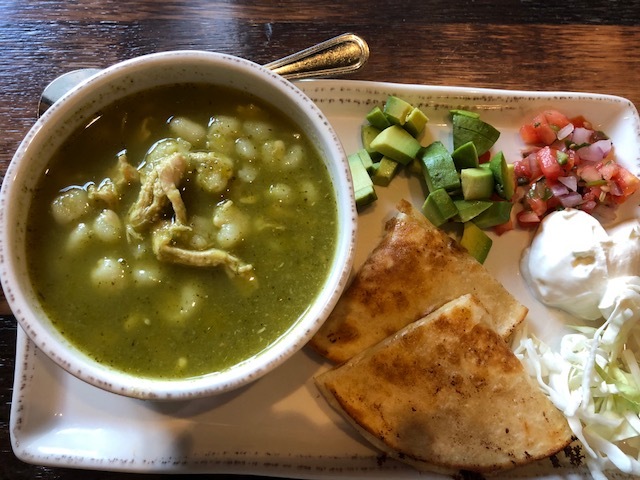 Not sure about Mexican food with a southern flair, we are pleasantly surprised with more excellent meals. 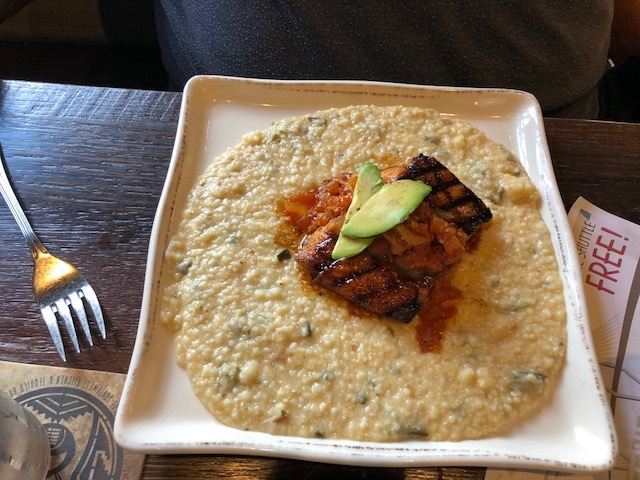 Salmon and jalapeno cheesy grits! Tasty posole - very good. 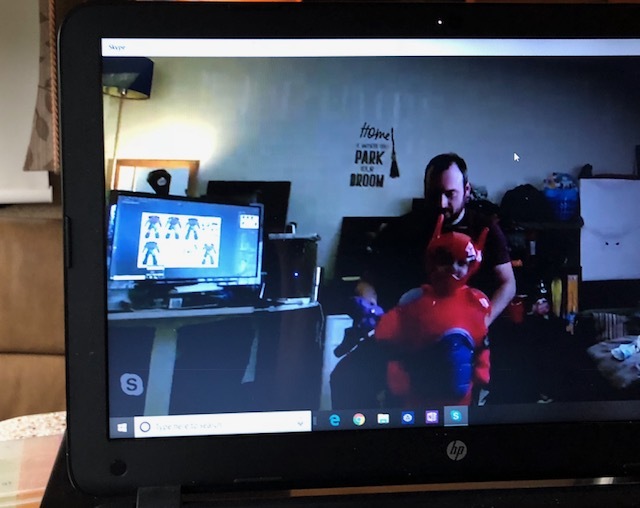 In the evening we catch up with Ezra via Skype - he's getting so tall! Showing us his Baymax costume. Sunday we watch football while it rains off and on all day. My plan was to return to the historic district to visit the Aiken-Rhett House but a hot and rainy day says staying home is the better idea. Next up we visit another historic city in our 40th state. 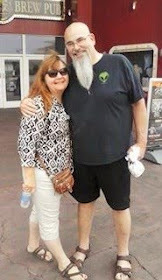 So sorry you had hot and humid for your visit to Charleston. It is such a gorgeous city it deserves a walk around. Wish all our history was restored and not replicated but you had to save it in order to do that rather than tear it down. I think we have a huge case of lack of foresight. Could be said about our 2016 election as well. Being from the south, of course I knew the Confederates had sub marines and I knew they were iron but I had no idea they were pedal powered. Are you kidding me? Doesn’t sound like such a good plan to sink a ship and sink your own in the process. The pedal power reminded us of the big Viking ships being rowed across the seas! It is sad to think of all the history we've torn down in the name of "progress". Charleston has a lot to be proud of for the decisions (not all of them) made in the past. Hope you have time to visit Fort Sumter, it has a most interesting history. However it does take most of the day and we did miss much of the beautiful city Charleston as a result. We'll see it when we go back - it looks like an amazing historic site! So glad you're loving Charleston! It sounds like you had a great tour—and only six of you on the bus sounds perfect. You learned some things we didn't learn in our walking tour (petticoat stairs, for one!). Thanks for the terrific restaurant suggestions—we're heading back to Charleston next spring and Sol and Angel Oak are now on my list. I was bummed I didn't get to see the Aiken-Rhett as it was on the list since reading your post!! You won't be sorry with either of those eateries - so good. 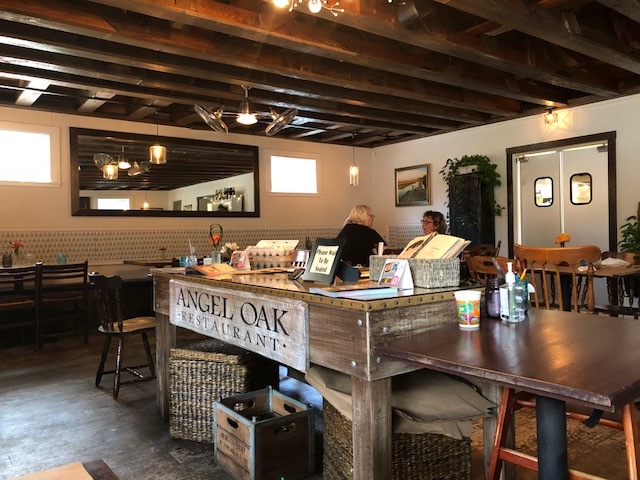 Angel Oak is more local, sustainable fare. I too love Charleston--took one of those bus tours when working for Kimberly-Clark. Are you guys now out of the heat/humidity?? For the most part yes. We had some yesterday in our travels but last night was a wonderful 43 degrees and our time in Melbourne Beach was perfect! The Charleston tour was one of the best we've done. That bus tour looks like a great way to see Charleston. The architecture is fascinating yet I wouldn't like to sit on my porch and see the neighbors wall. Petticoat stairs seems like a lot of extra work when building but does lend a nice symmetry. I always figured they were decorative so the "practical" aspect was a surprise!